Served as a salad, over pasta or mixed with cooked lentils, this dish lends itself to variation. Preheat oven to 450 degrees. Peel and trim the eggplant and dice into 1 1/2 inch cubes. Place in a stainless steel bowl. Wash, then quarter the mushrooms and add to the eggplant.Salt the eggplant and mushrooms, then toss with oil, garlic, herbs and pepper. Lightly grease a jelly-roll pan (15 x 10 x 1 inch) with pan spray and spread the eggplant mixture onto it. Bake the eggplant mixture in a 450 degree oven for 30 minutes then turn the mixture with a metal spatula and bake for 20 minutes. 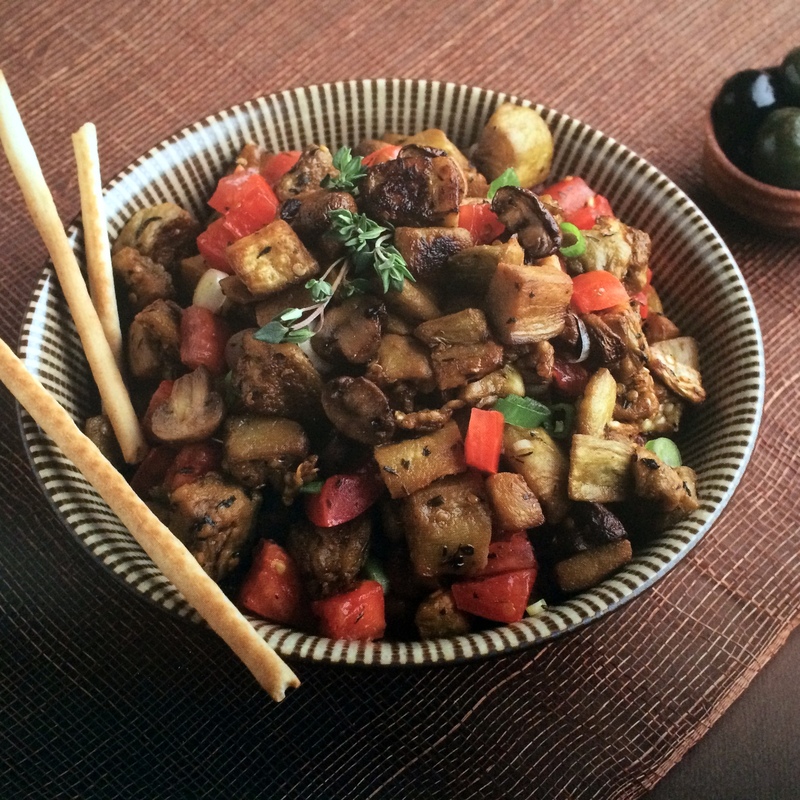 The roasted eggplant and mushrooms should now appear dark brown, caramelized color. While the eggplant and mushrooms are roasting prepare and mix the diced tomatoes, sliced scallions and lemon juice in a large stainless steel or glass bowl. After the eggplant mixture has cooled, add to the tomato mixture. This entry was posted in roasted eggplant, vegan, Vegetarian and tagged appetizer, chef@isimmer.com, Eggplant, eggplant salad, lentils, roasted eggplant, salad, vegan. Bookmark the permalink.